Cortona was an Etruscan town that today offers many important remains: the outer walls, the bronze lamp from the 5th. century BC, the majestic tombs of noble families with the latest discovery, the Melone II of Sodo, dating back to the 7th. century BC. The Etruscan town welcomes its visitors not only on behalf of the "Lucumoni" (the ancient Etruscan lords), but also on behalf of its popular patron saint, Saint Margaret of Cortona along with San Francis of Assisi who founded the hermitic monastery of "Le Celle" in Cortona. It was one of the most evolved medieval city-states, still profuse with pure renaissance forms; The Calcinaio church, Francesco di Georgio Martini's masterpiece. The present perimeter is about 3 Km. And it coincides, for almost 2/3, with that one of the ancient Etruscan town-walls, on which the present walls are built. The Etruscan remains can be distinguished from the overhanging walls which were built during the Middle Ages, because they are made of huge quadrangular rocks. On the hilltop of the cortonese's hill is the Medicean fortress required by the Medici family and built by Francesco Laparelli in 1549. 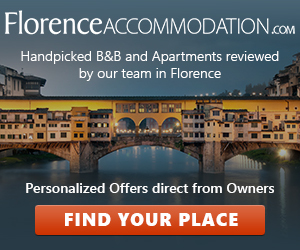 Cortona, hometown to so many famous painters from Luca Signorelli to Pietro Berrettini da Cortona to Gino Severini. 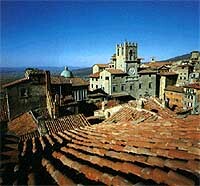 And then the last little secret about Cortona: some ancient historians suggested that Ulysses was buried here! It is only a legend, but what an extraordinary one!